Drug and Therapeutics Bulletin (DTB) | DTB provides independent evaluations of treatments and the overall management of disease for doctors, pharmacists and other healthcare professionals. Drug and Therapeutics Bulletin provides practical, independent, evidence-based information for practising healthcare professionals. DTB publishes succinct summaries of the best available evidence to enable readers to make informed and unbiased choices regarding medicines and other treatments to help patients get the best care. Drug and Therapeutics Bulletin adheres to the highest possible industry standards concerning publication ethics. Content is commissioned and undergoes a rigorous and transparent editorial process. DTB is also wholly independent of the pharmaceutical industry, Government and regulatory authorities and is also free of advertising and other forms of commercial sponsorship. Drug and Therapeutics Bulletin publishes regular podcasts discussing highlights from its issues. Discover them here. Michael has lived with chronic pain for over 30 years and was taking high doses of morphine over a long period. What impact did this have on him and his family? Watch the video and read the article “Where now for opioids in chronic pain?”, by Dr Cathy Stannard, Consultant in Complex Pain, in the October issue of DTB. All content in DTB is commissioned and undergoes a rigorous and transparent editorial process: articles are peer-reviewed externally and internally, authors and DTB Editorial members are required to declare and publish any conflicts of interest. 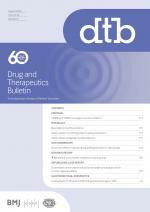 DTB publishes reviews, editorials, select summaries and case reports. Read more about our content in the Welcome to the new Drug and Therapeutics Bulletin Editorial.